Popular novel Kim Ji-young Born 1982, which was written by Cho Nam-joo in 2016, is receiving much attention from Chinese readers—even before the official Chinese translation has been published. This, for one, illustrates how Korean cultural trends are catching on in China. Interest in feminism has slowly been on the rise there, and there are glimmers of the Me Too movement, although neither has reached the levels of activity seen in Korea. News in Korea reaches China almost immediately, so naturally, the book has attracted much popularity and discussion. Although a translation of Kim Ji-young Born 1982 has been prepared for release in China, the book was first released in Taiwan. 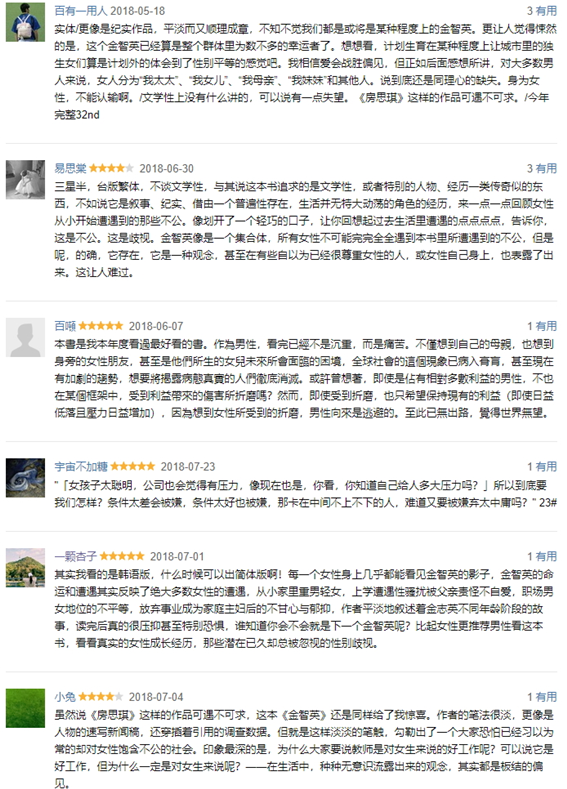 Although it is difficult to gauge the general response of Taiwanese readers, up to 20,131 users have rated the book on Chinese social media site Douban, and 72 users have left short reviews. Presumably, there are users from Taiwan or Hong Kong within these numbers, and some have probably read the Korean version of the book. But considering that the book has not been officially released, these numbers are unusually high, especially compared to those of other Korean books. 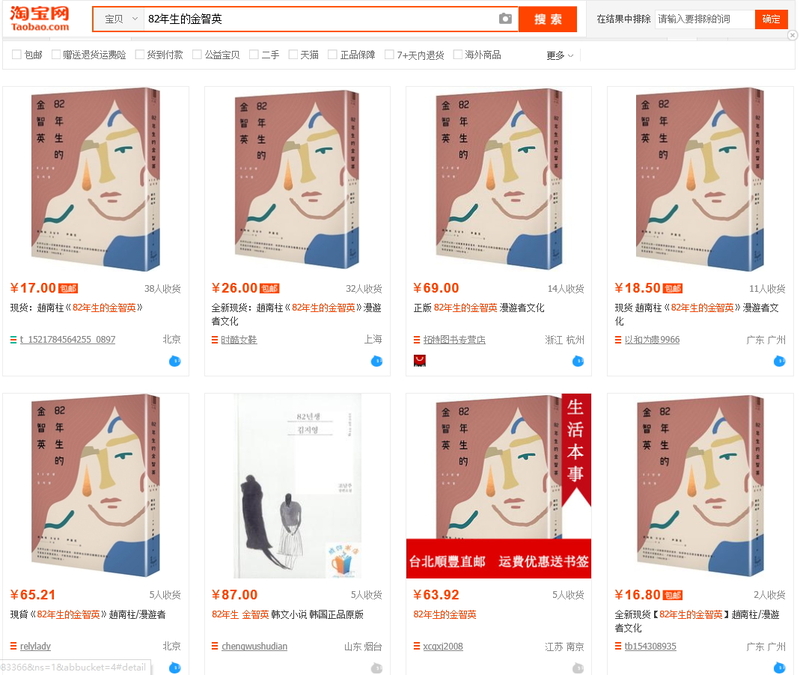 While a Chinese translation of Han Kang’s Human Acts has been published in Taiwan, it has not been published on the mainland. While Kim was published this May and Human Acts this January, only 17 people have rated the latter novel on Douban. Chinese translations of Korean novels are usually not that popular in China. The number of ratings does not rise above the dozens. The most recently popular novels were The Vegetarian by Han Kang and Pihaengun by Kim Ae-ran (translated into How is Your Summer? in Chinese), receiving 544 and 255 user ratings on Douban, respectively. Based on just the numbers, Kim Ji-young Born 1982 has been considerably popular in China. While the depth and quality of the novel may have attracted readers, the book’s subject content probably drew them in as well. One Douban user who said they had read the Korean version said they were anticipating the book’s release in simplified Chinese, and wrote the following review. Most reviews are in the same vein. They echo the sentiments expressed by Korean readers. After reading the e-book myself, I also agree that this book should be read more by men than women. While this book may represent a familiar reality for women, it may awaken men to the inequality and discrimination present in their surroundings. It is predicted that Kim will be read more than The Vegetarian once the Chinese version is released. We can see this not only in the interest in pre-sales, but in the way the book’s representation of reality resonates with so many readers. The book is relatively expensive in Taiwan and can only be bought through purchasing agents. But more Chinese readers may read the novel once it becomes easier to purchase the book. Fortunately, illegal e-versions of the books are not being distributed yet, but illegal copies of the book are being sold. While there aren’t many, these versions are being sold publicly on Chinese online shopping site Taobao, and some users have bought their copies there. Readers who have bought illegal copies of Kim are probably fans of Korean literature and culture, and may buy the official translation once it is released, even if they bought illegal copies out of their desire to read the book quickly. I hope the official translation of Kim is released before the number of illegal copies increases.